Shennong Stream between Wu Gorge and Xiling Gorge on the Yangtze River is a popular shore excursion site, highlighted with the tranquil and primitive natural landscape, mysterious history, stories and folk customs about hanging cliff and trestle road in the past, and other interesting local culture. Shennong Stream (神农溪), a 60 kilometers’ small tributary of the Yangtze River, is famous for its picturesque scenery and announced a “National AAAAA Tourist Attraction”. It originates from the south hill of Shennongjia that is regarded at the “No.1 Peak in Central China”, and located on the border between Wu Gorge and Xiling Gorge. It is a mysterious place filled with history, culture and nature’s splendor. Visitors can board a traditional sampan, drifting to see cascading waterfalls, steep cliffs, karst caves, three-colored springs and an amazing array of fish, birds, and monkeys playing near the riverside. Also historic and cultural wonders reminds here. Carved into the steep cliffs a plank road was built in ancient times to help travelers on foot navigate the gorges, and ancient hanging coffins are suspended high on the cliff faces. You could take some time guess about the mysteries of the handing coffins, local ancient trestle road along the cliff, and the trace of the ancient savages there. Moreover, sweet love songs of the local ethnic people can be heard. On both banks of Shennong Stream, emerald mountains rise continuously and windingly, with diverse features of magnificent, elegant, strange and precipitously, which forms four distinct gorges, namely Longchang Gorge, Parrot Gorge, Mianzhu Gorge and Shennong Gorge. Besides, drifting on the local sampan and appreciate the hanging wooden coffins are must-enjoy highlighting activities at Shennong Stream. Check the features of each one at below. Longchang Gorge (龙昌峡) with the total length of 5.7km winds deeply like multiple entrances in the valley, and the entire gorge is less than 20 meters wide and looks really magnificent. There’s no wonder that the famous poet Du Fu in ancient Tang Dynasty praised this gorge no primitive and idyllic when he visited this amazing place. Besides, nowadays, during your boating time here, you could enjoy the beautiful reflection of the lush mountains, blue sky and white clouds in the water, appreciate the passing sceneries on the banks while you are still, and spend every second in the “picture scroll”. Mianzhu Gorge (绵竹峡) of 5 kilometers long is famous for its precipitous feature. Since this gorge is so narrow, with the narrowest part of no more than 5m, you could find a view called “Yixiantian”, which is a thin strip of the sky. While you are marveling at the unbelievable skill of nature, you could enjoy the colorful lush vegetation and fragrant floras on banks. Every corner is a chance to treat your eyes. Take the sampan to stroll along such a nice wonderland on earth. Parrot Gorge (Yingwu Gorge, 鹦鹉峡) is 7.5m long totally and featured with elegance. In this gorgeous place, visitors could admire the green hills standing on both banks with full mountains of blooming flowers, rose in spring, cottonrose hibiscus in summer, wild chrysanthemum in autumn and wintersweets in the cold winter season. Every blossom and every plant decorate Parrot Gorge so well to make it seem from afar many different excellent landscape painting works hanging in the sky. The burial of hanging coffin is a burial ceremony of ancient Ba people who are the ancestors of local Tujia ethnic group at Shennong Stream, having a long history of over 2,000 years. It is said the higher the coffin is hung on the cliff, the better official position and prosperous live the children of the dead people would get, which is because the world “coffin” and “official position” share the same pronunciation of “Guan” with the in Chinese. At present, if you visit Shennong Stream, you could find some very old coffins hanging in the small cave on the steep cliff at the gorge. However, the mystery of how ancient people put and hung and so heavy coffins up there has not been solved yet. Taking a small local sampan (豆荚船, peapod boat by local) to drift along the Shennong Gorge would be the best and happiest thing to enjoy the charming primitive sceneries and feel the simple and nice of Mother Nature. Since the stream is very natural without pollution, the extremely clear water could be seen, in which colorful and diverse shaped cobblestones would make your drifting more interesting. Board on the so lovely boat to enjoy the really antique and historical means of transportation in China. Shennong Stream is located in Badong County in Hubei Province, about 3.5-4 hours’ driving distance from Yichang City. For visitors taking some specific Yangtze River cruise ships, you can visit the stream during your cruise since the ship would stop there for several hours for your discovery. Besides, there will be local guides to lead you to the tourist area, so you don’t need to worry about the transportation. Just focus to enjoy the sceneries and time with other visitors. 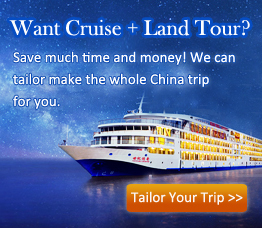 Check which Yangtze Cruise ships visit Shennong Stream. Among all months during a year, May to October is the best time to enjoy the eye-pleasing verdant forest, clear spring in Shennong Stream. Besides, weather during those months is the most suitable and stable for enjoying a holiday. You can appreciate the beauties of four seasons once during that period. No matter escaping from the summer heat, pursuing for some serenity, or discovering some mysteries.